So what’s being going on in the FS universe this week? The biggest scenery hoo-hah this week is the release of Orbx’s new FTX AU scenery: Brisbane International Airport (YBBN). If you follow Orbx, you have a pretty good idea of what sort of quality level to expect (hint: ultra high). The pre-release video by Jaggyroad Films below gives an excellent impression of the scenery, and if that’s not enough then the product page should answer any other questions you might have. Thanks to their continuing research into better modeling methods, this is not only one of the largest, most detailed airports they’ve done, but is also a much better performer than their previous large release, YMML. The difference is their so-called “Textureflow” technology, which has been retrofitted to YMML and their other airports as well, another sign of their commitment to continual improvement. YBBN is of particular interest to me, as I’m currently working on KPDX – a similarly sized airport – for FTX. It’s always good to know where the bar is, quality and performance wise. Heard enough of me crowing about the Accusim-enhanced A2A B-17? Too bad. 😉 Maybe it’s because I get in a whopping hour or two of flying for fun each week, but this baby still has that new plane smell for me. As an update to last week, I managed to memorize the engine start and preflight procedures, and have progressed to buzzing around the pattern. Actually, I set out to do a short cross-country last night, but some bizarre technical glitches with my onboard sound card brought the flight to an abrupt end. Before I got dumped to the desktop, I did have a chance to finally experience the radio man picking up a little music and piping it to the cockpit for me. That is exactly the sort of touch that makes A2A’s stuff a cut above the rest. And in case you hadn’t noticed, the repaint masters have been dialing it up to 11 in the livery department lately. Check out the A2A site and Sim-Outhouse for some beautiful repaint pics. Oooh, the thrill of anticipation. Sometimes it’s better than the actual payoff, you know? Only in this case, I’m betting the flying experience will still trump the waiting. The previews that have my attention right now are all three GA (surprise!) — two from Carenado, and one from Milviz, who are doing their first self-branded plane after supplying models to several other well-known devs for a while now. If I had to guess, the closest one to actually releasing is Carenado’s F33 Bonanza. They trickled out a few more screenshots a couple of days ago, and have announced that it’s officially in beta. Can it be long now? Man, I hope not, ’cause look at that VC. Mmmmm…. Plus, the outside’s not too shabby, either. It’ll be a welcome change from the Cessnas and Pipers I’ve been cruising in lately. In other Carenado news, they announced their next project after the Bonanza. Drum roll, please. It’s the Cessna 208 Grand Caravan. This is an interesting choice for them, as it’s substantially larger and heavier than their typical fare, and a turboprop to boot. One variant I’m hoping they’ll make is a cargo version without the side windows, as flown in large numbers by various freight carriers like FedEx. Like a lot of ‘simmers, I enjoy simulating flights that I have more experience with, and the skies over my house are abuzz every evening with swarms of FedEx Feeder 208’s, making their return to KPDX. It’s early days yet, but the renderings look promising. 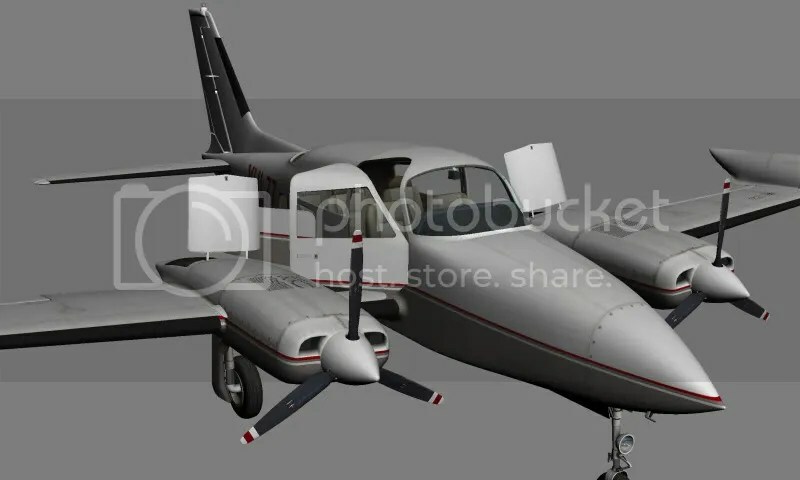 Last but not least, Milviz (who’ve mostly remained behind the scenes up ’til now) are staking their territory with a new Cessna 310 model to be released under their own brand. Their modeling skills are well proven, and apparently they’ve added talent in the gauge coding and flight dynamics arenas to their roster as well. This will definitely be one to watch. I might only get a couple of hours of “fun” flying in each week, but that doesn’t mean I’m not spending a ton of time in FSX. The project du jour is, of course, Emma Field X. This week, I’ve been concentrating on dialing in the ground textures for Emma itself (herself?). It’s a curious challenge: try to create what is in essence an aerial photograph of a place that doesn’t exist. The fiction writer in me enjoys the world-creating that’s involved, especially working out the logic of things like how the roads would be laid out, where there would be forests, and where the trees would have been cut to facilitate approaches and landings. The trick is assembling the various photographic bit in Photoshop to make groundwork that’s convincing in the sim. I’m happy to report that things are definitely looking good, although I’m not quite ready to show shots. Soon. The fiction writer in me has also been busy, er, writing fiction. The goalposts for finishing my current novel manuscript move constantly, but I’m doing my best to fix them in place. This is the month, I tell myself, that the first draft comes to a conclusion. And for the first time since I started writing this piece over two years ago, that actually looks doable. For those who are new to the blog, I’m working on my second novel-length manuscript right now, working title: Last Thursday. It’s a murder mystery set in the Portland, Oregon arts scene. Once this draft gets done, I take a breather, finish up Emma, and launch into re-writes. So that’s what’s going on in my world. What’s up with you? 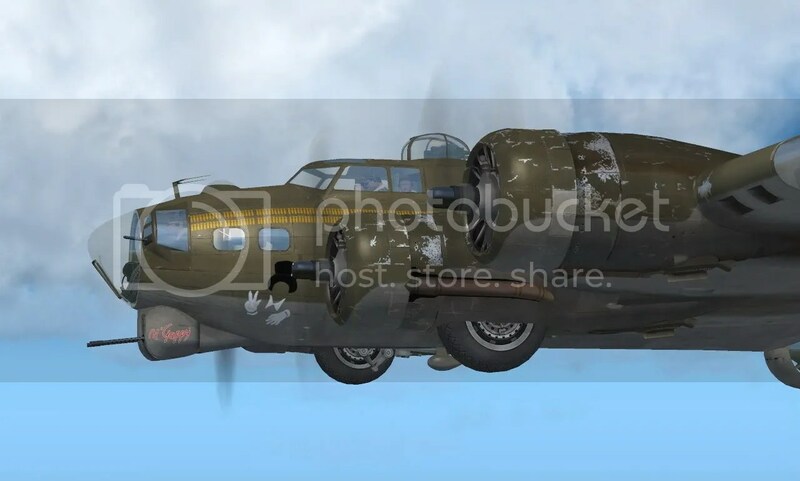 This entry was posted in A2A Simulations, Aircraft Reviews, Carenado, Emma Field, Fanboy Fridays, FSX, FSX Scenery, FTX AU, Uncategorized and tagged A2A B-17, Brisbane International, C208 Grand Caravan, C310, Carenado, Emma Field X, F33 Bonanza, FTX AU, Last Thursday, Milviz, ORBX, YBBN. Bookmark the permalink. Whoo! Your making KPDX, awesome! Have you already began or are you doing it after Emmes Field? Defentily will love to do the C20B from KPDX – KSEA!! And YBBN rocks. I’ve downloaded and configured the high-res aerial shot of the airport, and have gotten in touch with someone at the airport authority who’s agreed to help us get all the photos we need. That’s about it until Emma is done, though. It’ll be a long, interesting process, I’m sure. Thanks for the read Bill! I was getting worried. hello sir…i’ve been in line waitin’ for quite awhile to say to you what others have already flocked to say: THANK YOU…for all you’ve done and are doing for our community, and for the stuff that’s on your ‘drawing board’. i’m new to this ‘twitter’ and ‘blog’ stuff (i know, where’ve i been?) and thus have been followin’ you. maybe it’s crazy, but i visit your website, along with the websites of Chris Palmer’s Angle Of Attack and Jason’s MzeroA, on a daily basis to get knowledge of real procedures for my FSX xperience. oh, i wanted to let you know that i’m a listener of FSBreak and enjoyed their interview with you. listening to you talk about about your involvement with the FS community gives a personal touch to my flight simming experience. That’s mighty nice of you, Ron. Thanks for checking in – and don’t be a stranger! I love to hear any and all comments. let me get to know a little bit about you. Reading your blog is a delight and following your progress is like peeking behind the curtain of a great stage play. I share your frustration at finding the time to just enjoy flying the sim. I dl’ed your excellent Spirit of 76 repaint and use the 185 in my Air Hauler flights in the NA Blue scenery. I encourage you to keep figjting the good fight to raise our enjoyment of FS to ever higher levels. Thanks, Chuck. I have to admit, getting responses like yours from fellow ‘simmers is as much fun as flying or developing. Thanks for taking the time to write. Blue side up! Hah !! Having been my own boss for almost 5 year too now, I can relate to your remarks. I now work 12-14 hour days, 7 days a week, earn about 25% of what I used to – if I ‘m lucky – and with the current crisis in economics and otherwise, it looks to be getting less, not more. So we’ll just ‘tinker on’ knowing that even though we work double the time of salaried workers, and even knowing we don’t have holidays and days off, we still have that mental freedom that they don’t. That justifies it for me.